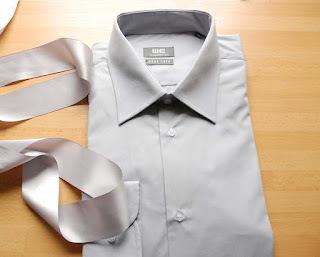 Anyway, the wedding is tomorrow and I think I'll go with the silver dress after all (I bought a light shaper to smooth out any lumps in the hip and thigh area... I may wear that with it). I guess black has been such an everyday colour to me for so long that it just doesn't say 'special occasion'. For me, it means I may have to whip up some kind of shrug tonight or in the morning, to keep the cold at bay. Anyway, that's where I am in relation to previous posts. I have, in fact, been sewing a bit this past week. 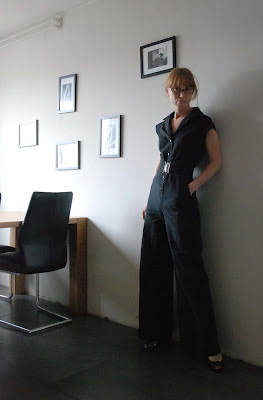 These culottes don't have the center front and back pleat nor the extreme width of my earlier little-skirt-like pair. 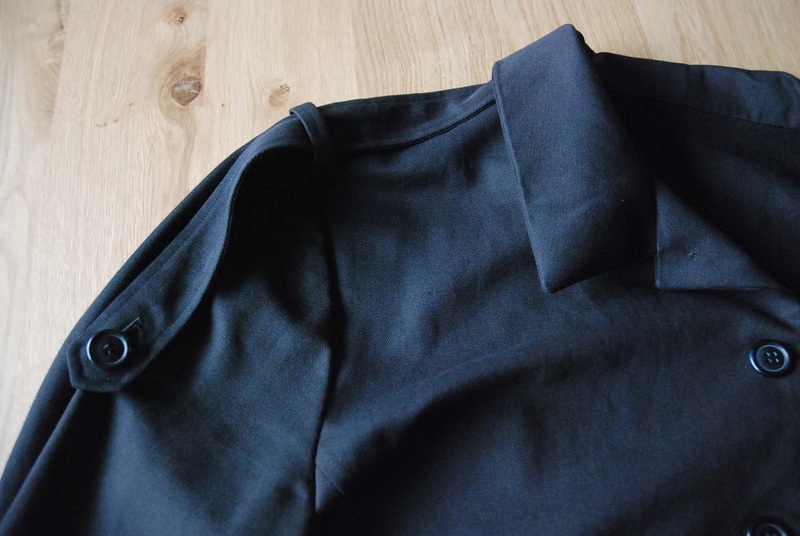 A trouser block would have the crotch curve shaped to provide a close fit between the legs from front to back. 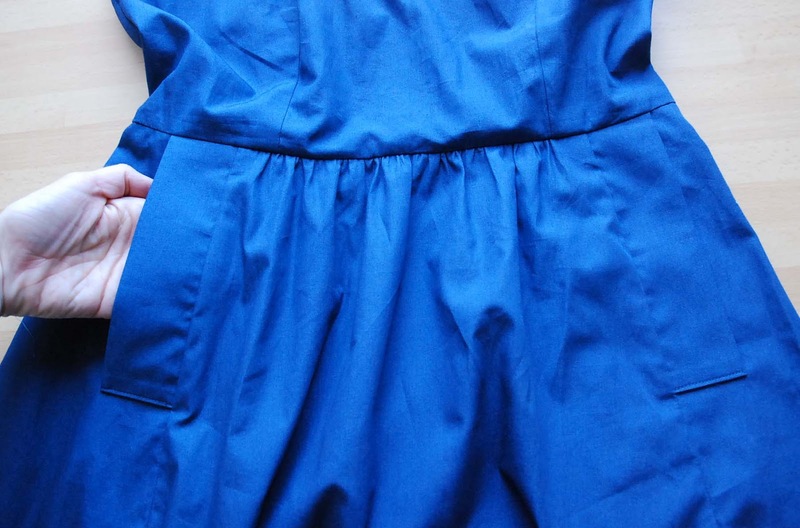 In a culotte pattern the legs are more loosely connected. That helps to provide a skirt-like appearance. These culottes/trousers have a waistband at the natural waist and in-seam pockets, positioned just where the flare starts on the hip. I bought this fabric on sale at the market at the end of last summer. I always thought it had to be used for something very loose and flow-y. And it definately couldn't be used for a top. This colour, worn close to my face, would really make me look like death. For bottoms, it's fine though. When I was drafting the pattern, my boyfriend was a bit skeptical. 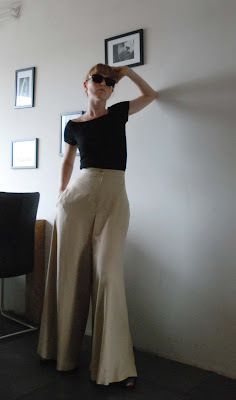 From my describtion of what I was making, he thought it would look like the kind of trousers my mother likes to wear (my mother who is now actually able to wear some of her normal trousers again. About two months after the surgery, the swelling on her hips and legs has finally subsided to a more reasonable degree. She does have a very own sense of style. Lots of colourful, floaty things. And of course, there's that eternal cliche that women don't want to look like their mothers, but inevitably do). He doesn't think so anymore. And I actually feel quite glamorous in these. When the hot weather returns, they will do just fine. I don't have a lot of experience dyeing fabric or clothes. I've 'met' other seamstresses in the blogosphere who are past mistresses at this particular art, but I'm not one of them. They have caught my attention though. It's not like I didn't know dyeing was possible. I remember when I was about ten years old, my mother wanted to throw out her pale yellow summer coat because of a nasty stain she couldn't wash out. Little miss smartypants I was, I suggested she'd try and dye the coat. She bought purple dye and although the colour turned out quite a bit lighter than expected, it did cover the stain and she wore the coat for several more years. Once on my own, I tried dyeing only one time. 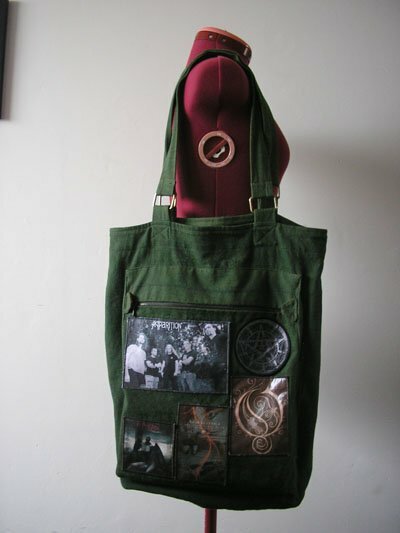 It was a piece of canvas which I dyed green to make a grocery bag. The dye job turned out a bit uneven but yet, I loved that bag and used it a lot until it was stolen off the back of my bicycle (as I was riding it. I fell and hit my head, not a good memory...). Enter designer friend M who used to design for a line of 'garment dye' clothing. I don't know if you're familiar with that term and technique. It just means that garments are sewn up in undyed fabric which is coloured and shrunk to size by the dyeing process afterwards. If you know what to look for, you can spot this effect in some RTW clothing (usually, it's about thread in the exact same colour and a slight rippling at seams, especially at flat felled ones. It's mostly used for casual clothes). The shrinking bit meant that all designs had to be tested in the proper fabric, to make sure they would end up being the right size. So, when she stopped designing for it, she was left with several rolls of the fabric. In different thicknesses and weaves. When moving her studio recently, she considered throwing those rolls of fabric out. Since we've been using it for muslins these past years, I spoke up against that idea but I also offered to take a roll off her hands. This one. 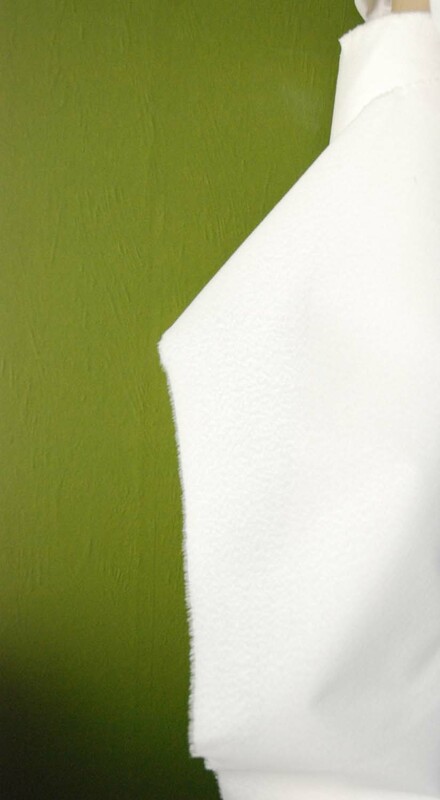 It's just about impossible to photograph, but it's a fairly stiff cream white fabric with a slightly ribbed texture. The green is just the wall of my sewing room (which has three white walls and this one in green). I took it to make my own muslins, but I was also interested it the true nature of this stuff. So, to finally come to the point of this post, I tried dyeing some of it. I considered red and blue, but went with green (again). I'm glad I did because this was the result. It appears this fabric was made up from two different fibres. I would guess the one that didn't take the dye to be polyesther but I know the brand M used to work for had a strong preference for natural fibres, so I just don't know. A burn test didn't help either. Now, it's a supply fabric, with a hand like heavy crepe and a delightful, muted moss green colour. 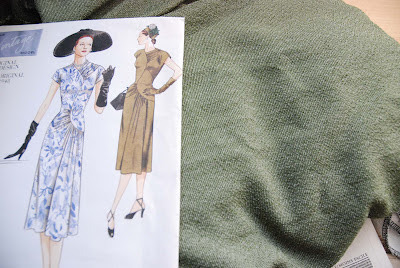 I think I will use it to finally sew up this reproduction Vintage Vogue dress. I bought the pattern years ago but then, my pattern making habit took over and I had a hard time finding a suitable fabric for it. But, the weather here has quite suddenly turned rather warm, so I may go for some more season-appropriate things first. Thank you all so much for commenting on the previous post! You've taught me things I didn't know, given me new insight, shared great stories and occasionally told me not to be silly... I'm grateful for all of it. Although I should really answer all comments in turn, I will use this post to summerize and give some further explanation about the event. First of all: the wedding itself. It starts in the afternoon and continues with a party in a small restaurant at the beach (all of those are rather casual locations). 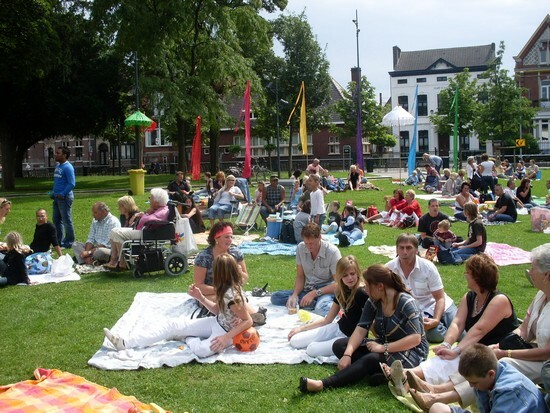 Secondly, the Dutch are notoriously casual dressers. Apperently, wedding guests in jeans are not uncommon here. Even though I don't consider that an excuse not to make an effort, it is something to keep in mind. Full evening attire would definately be considered 'over the top'. And third, several of you suggested asking the bride about her idea on colours. I haven't yet but as I know this couple, they are usually casual dressers who wear a lot of black themselves (the groom to be is the drummer in the heavy metal band E plays in...). I know she will wear a formal ivory white wedding gown and he will wear a suit, but I can't imagine the two of them obsessing over the guests' choice of outfit. All that being said, I did try to find other, non-black fabric yesterday. In colour(s) which wouldn't MISmatch E's outfit (which is still difficult. Some commenters suggested blue might work with his shirt. Well, lighter shades clash with the shirt, darker ones with the suit...). I did find two types of fabric in the same blue-ish, silver-y grey: thin polyesther satin (which I didn't buy because I really don't like that stuff) and cotton jersey. I bought the jersey, with the thought that I could always dye it if the colour really doesn't work for me. The black cotton voile dress. Here worn with my usual belt, a (too short) crinoline petticoat and my molded leather necklace. Not so much a bad look, but maybe a bit too goth for the occasion? Here it is without petticoat and with that ribbon. As said, I'm not really a fan of the ribbon. It doesn't stay in place very well either. E says it's OK, I like the top but am not entirely sure about the bottom (of course, chopping it up and using it as a top could be an option). What do you think, seeing the options 'in the flesh'? E. owns only one suit and I don't think he has ever worn the trousers and jacket together yet. In fact, I know he hasn't. I was there when he bought it and it was after the previous three weddings in our circle of friends. This one suit is black, a sort of muted, not-entirely-saturated sort of black. You know, it's the kind of black fabric which doesn't match at least half of the other black fabrics you may come across at any given time. And he has two formal shirts to go with it, both of which are in a peculiar blue-ish pale grey. I've been pretty good about trying colours lately but to match this outfit... Are you surprised that the only fabrics in my shamefully large stash which were a match for E's suit were some solid black ones? None of the above goes with the suit. I've made this dress, in a black cotton voile. I'm leaving it to hang for a few days before I hem that half circle skirt. On the one hand, it is nice although it still needs a slip and possibly a crinoline petticoat (which I haven't made yet). On the other, it's black. Unmistakebly so. I actually bought a wide ribbon which matches the colour of E's shirt but I really don't like the look of it with the dress. It just looks crappy and cheap. I'll show you these things on me later, but it rained this afternoon which meant it was too dark to take self-timer pictures, and did I mention needing a slip? And I'm already obsessing about fabric. Is a normal cotton too casual for a wedding? I should add that we'll just be two among many friends. We're not "those who have been best friends with the happy couple ever since primary school", or anything like that. So, it's very likely no-one will actually pay attention to what I will wear. I've never had a lot of ideas about dressing for occasions like this other than 'don't upstage the bride' but I read somewhere that one shouldn't wear black to a wedding unless it's to show disapproval. And I wish them all the best. 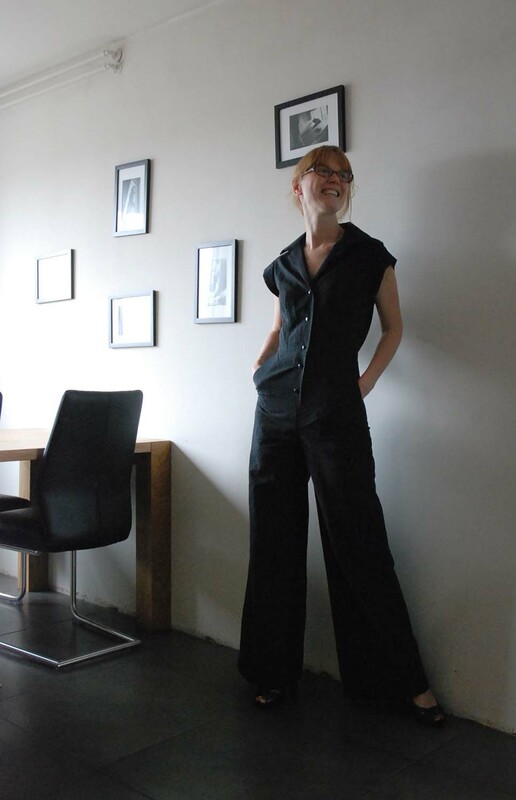 Please give me your opinion, dear readers: is it or isn't it OK to wear black to a wedding? 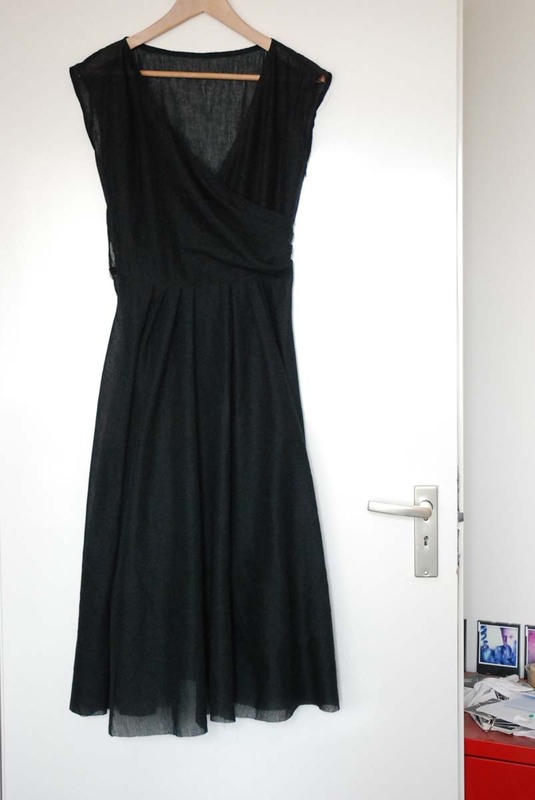 Would the black be less obvious if the dress were more of an LBD kind of shape (slim and fitted)? Is it a nice idea for a couple of nearly ten years to have sort-of-matching looks for the occasion? Is it bad to have clashing looks? What would you do? P.S. E won't wear a tie and pocket squares would look silly without, so there won't be another colour in the details. P.P.P.S. If I settle on some design and fabric, I should still easily be able to make a dress before the wedding. Here it is! My first genuine 1950's designed dress (worn here with my vintage shoes). 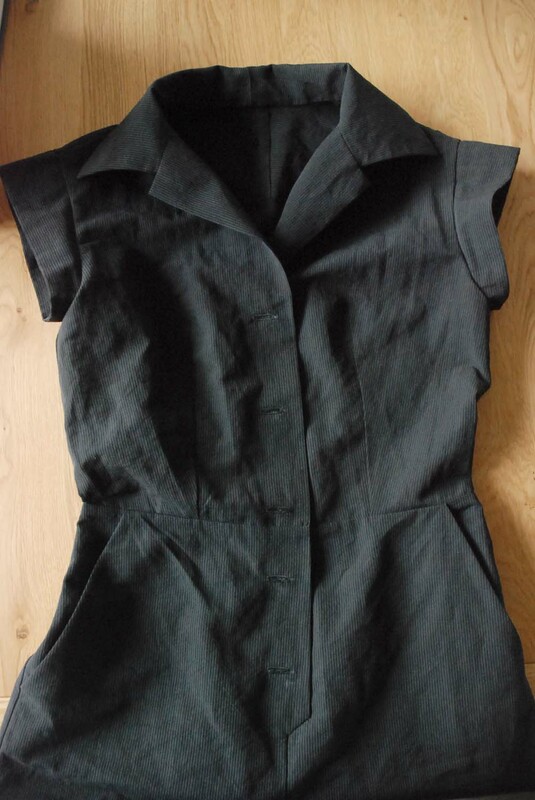 As I told you in my previous post, it's a hybrid, combining a 1957 bodice with a 1953 skirt. 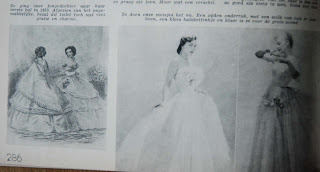 However, the bodice is such a basic design that I don't expect it would have been out of style 4 years before it was published. I stuck with the idea of differently coloured bands at the bottom of the skirt but, inspired by various dresses in Marion, I decided to do the small details in white (I used plain off-white cotton, lots of 50's dresses have details like collars or edges on pockets in white cotton pique). I made the decorative button placket on the bodice so I could repeat those colours, white and brown there. Worn with a belt, it looks fine. I like the look of sleeve and I like the pockets. 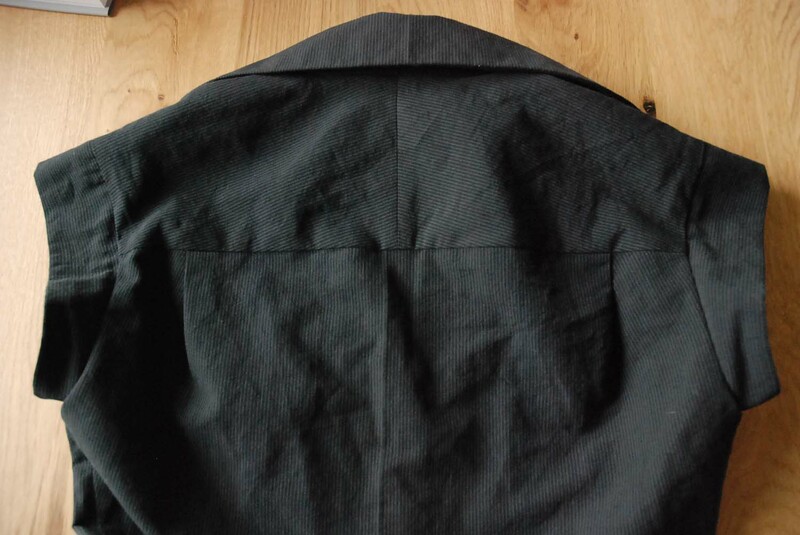 The skirt is, surprisingly, not that full (of course skirt width, like skirt length went through various stages). the single piece back is slightly less than half a circle. Parts of that same shape form the side front pieces while the center front has gathers. The pockets are in those front seams. I made it the length ordered by the pattern: 67 cm. 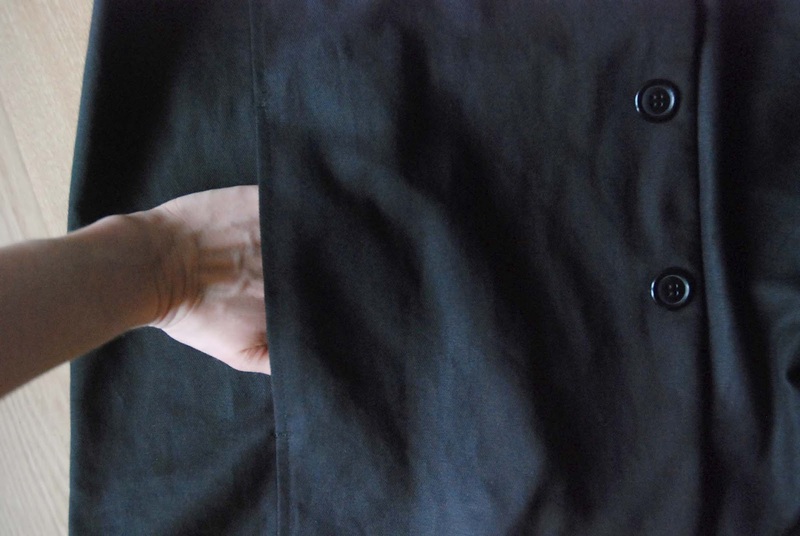 The rate of movement which the sleeves allow is OK, as long as you don't have to reach up a lot. Take the belt off, and the fitting issues are on display: During construction, I took the waist in by 1 cm on each side seam, so I took out 4 cm in all. It's still a bit too wide. It's also about 1 cm too high on my body. The bust dart points to about 0.5 cm above the apex of my breast and I should also have removed some width in that area. I also usually make the front waist darts longer than they are here, to get a more fitted look just below the bust. Some of these issues are definately down to me being unfamiliar with Marion's sizing. The sizing chart didn't include a back length measurement, so the only way to find out about that was to just go ahead and make something. 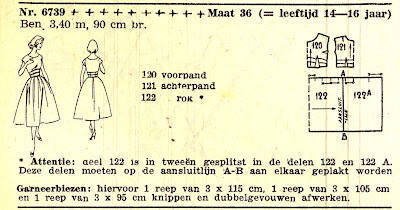 The adjustment I made to the waist, was the difference between the waist measurement for that size and my own, so I am surprised to find out they apperently added quite a bit of ease there. With that in mind, I should be OK using Marion patterns if I lengthen the bodices by 0.5 cm above the bust and 0.5 to 1 cm between bust and waist and take out width according to the sizing table. 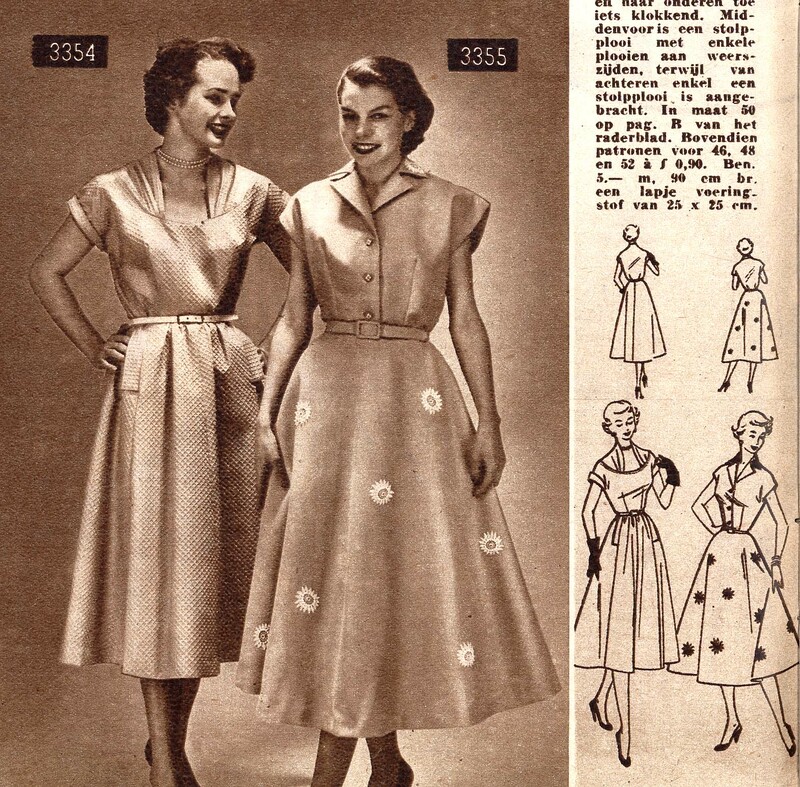 Remember those vintage 1950's sewing magazines I bought? Marion? I've been showing you some issues here on the blog already but only now, I finally decided to use them for their intended purpose: I'm making a dress. Unfortunately, it's on one of only two Marion pattern sheets which came without a magazine, so I haven't seen a picture. I picked this one because I've been wondering about the dimensions of and the freedom of movement provided by several vintage style sleeve shapes, including this small fitted cap sleeve. 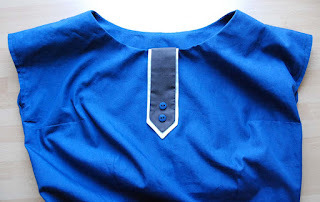 And I was curious about trying a scoop neckline for once (I usually avoid those). 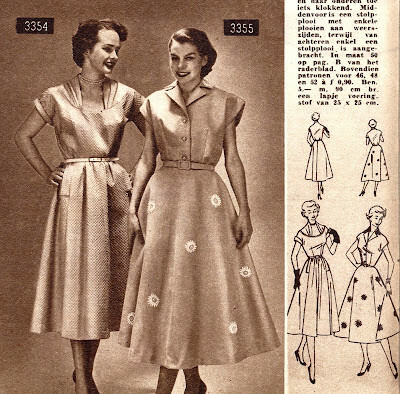 The one from the dress on the left, which is from 1953 and was also included on the pattern sheet in size 36. Obviously, the pockets were a major attraction here. I didn't go with this dress altogether because I was using the stash fabrics which I was considering for colourblocking. I figured I would need more of a 'blank canvas' kind of shape to make that work. Tracing the patterns was surprisingly easy, considering the look of those pattern sheets (I used transparent tracing paper laid on top because I didn't want to damage the pattern sheets with my tracing wheel). I guess black lines are easier to trace than coloured ones and it is less confusing with the pattern in only 1 size. What's more confusing than in modern patterns or in seperately sold vintage ones, was the absense of straight of grain lines and other such markings. Now, I'm off to continue working on the dress, and I'll do a show-and-tell later. Whom the shoe fits, wears it. Is that even an expression in English? I may just have translated that fairly litterally from a Dutch expression which basically means that a comment (usually but not per se a negative one) should be listened to by those it applies to, while the others are free to ignore it. I found these last Saturday at the market: vintage shoes. And they were in my size and after some deliberation, the sellers agreed that they were 2 euros a pair. Of course, at that price, I had to take them home. I went for these lovely things first. They've been worn but not a lot. They're still in very good shape. 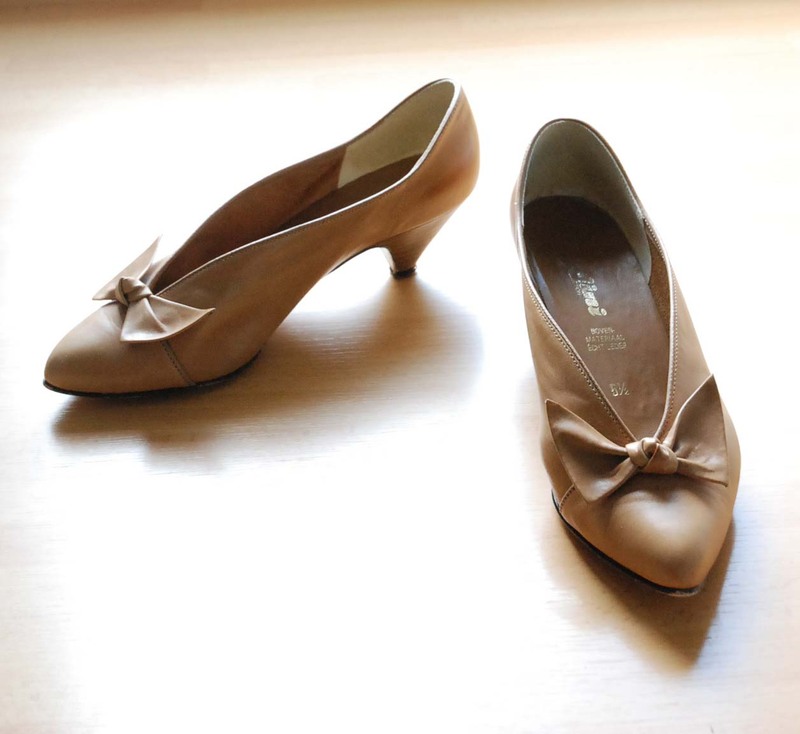 Leather shoes, with cute bows and a wooden heel. 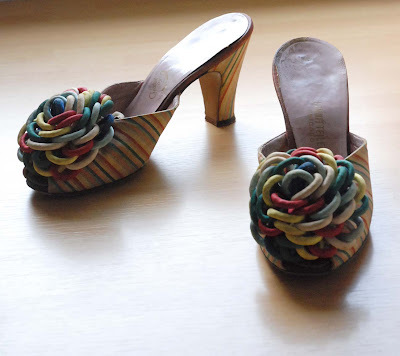 Very pretty, although that elegantly shaped heel is quite unstable (I think that's down to its placement. So far forward). 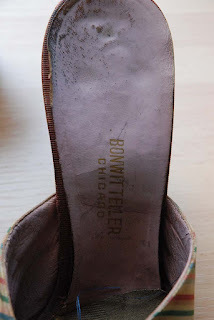 The text on the insole is in Dutch, so I guess they were at the very least sold and maybe even produced in the Netherlands. No idea about the date though. There lovely black sandels with their dainty ankle straps were next. Their shape looks similar to what I've seen in early 50's magazines, the stitching has discoloured a bit with age (old black thread often goes brown-ish). The insoles look a little worn, but they also contain quite a bit of information. I loved this: 'lasted by hand' Wow. I can easily imagine how the first two pairs might have been worn. The tan ones with a neatly tailored suit in spring (because of the light colour), the black ones with a dress. But these? Lavish home parties? The opening night of 'Joseph and the Amazing Technicolor Raincoat'? Oh, and this is a store name I have read about (over at Couture Allure): Bonwit Teller, Chicago. I'm still not familiar with the brand, created by Jerro, New York. 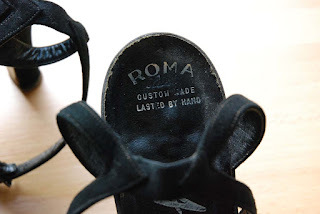 If anyone has any idea about the dates of these shoes or any suggestions about their original habitat (occasion, outfit etc. ), please speak up. I only know they all came from the same house. 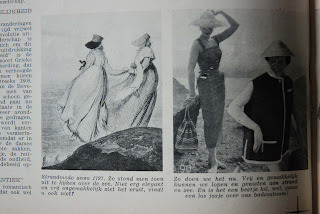 A while ago, I bought three books, each containing a year's worth of Dutch lady's magazine 'Moeder' (=Mother). The years were 1950, 1952 and 1954 and I bought them because, next to stories and articles about child care, they contain fashion news, nice pictures of designs for which you could order the patterns and the occasional sewing, knitting or crafting project. 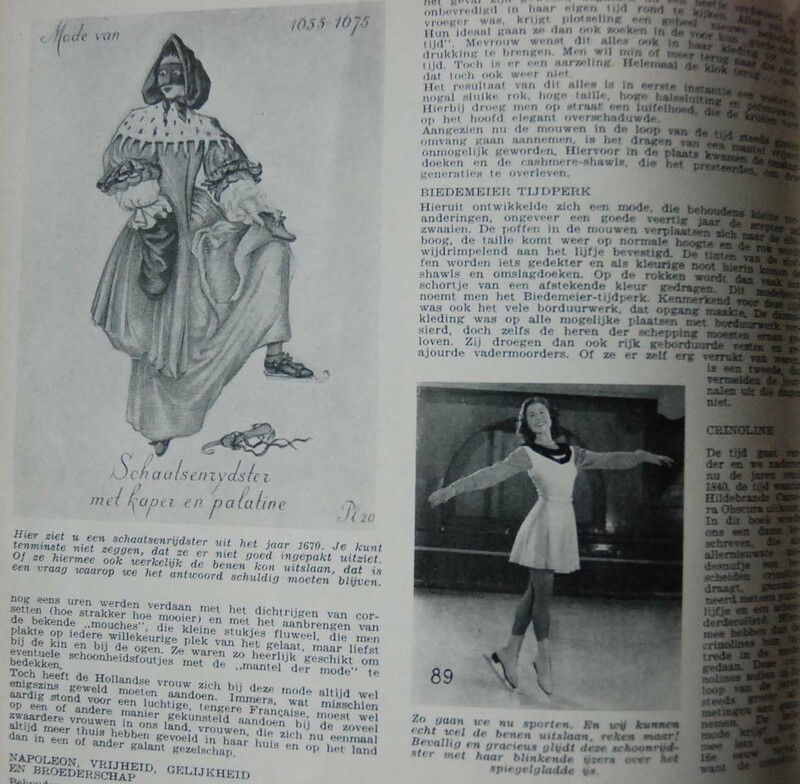 Entitled 'fashion through the ages' it is an educational but also rather smug article on fashion history. The text discusses developments from the 16th century onwards, in a fairly neutral tone. The pictures show looks for different events and times of day with historical ones shown next to their 'modern', 1954 counterparts. I'll show you those I could photograph in a more or less acceptable way, translate some of the text and, just for fun, I've tried to find 2012 equivalents through Google image search. The ball. This is how our young daughters went to their first ball in 1859. Despite the lack of comfort, these ensembles are rather graceful and charming. And at the right: This is how our daughters do it today. A silk underskirt, a could of tule over it, a little necklace and she's ready for her big night. In 2012, there are fewer occasions for formal ball gowns. With the theme of a 'daughters first ball', I decided to do a search for prom gowns which brought up things like this (I think a search for the other option, gowns for the debutante ball would have resulted in some more subtle styles). 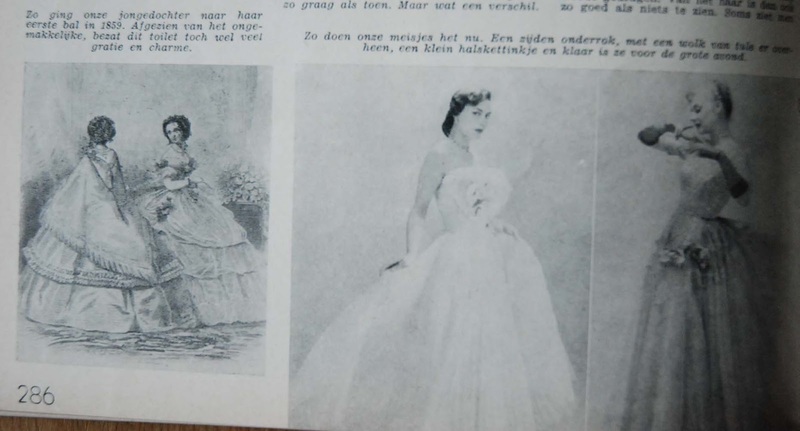 What strikes me most is the fact that, over a century and a half, the prefered silhouette for a yound lady's first ballgown doesn't seem to have changed significantly. Ice skating. On the left: Here, you see a lady from the year 1670, dressed for ice skating. At least you can't say she isn't warmly dressed. We don't know whether she could actually move her legs properly. And next to it: This is how we go sporting today. And you can bet we can move our legs! Elegantly, this figure skater moves across the smooth ice on her sharp blades. At the beach. These pictures are a bit too close to the center of the book, so the photograph doesn't look good, but I thought it was too much fun to pass up. Beachwear anno 1797. This is how one would look out over the sea back then. It looks neither very elegant nor very comfortable, don't you think? 1954: This is how we do it today. Free and easy, we can walk about and enjoy the beach and the sea. If there's a bit of a chill, well, we'll put on a loose jacket over our bathing costume. Anno 2012 the whole term 'bathing costume' has become archaic. This is the kind of look that's recommended to us now (available at an h&m store near you). A night out. These looks are for when 'madam' goes out, which I guess would mean a grown-up woman going to the theatre or something like that. 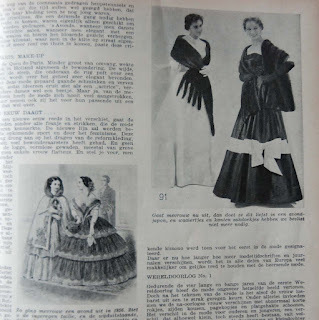 This is how madam would dress for a night out in 1856. Look at the cinched waist and the huge flowing skirts. Mark also the fan and the lace handkerchief in the ladies' hands. 1954. If madam goes ou nowadays, she will prefer to do so in an evening gown and we definately don't need fans or lace handkerchiefs anymore. There's a bigger difference in the silhouettes of these evening dresses than there was with the ball gowns and yet 59 years later, it seems that the trend of the deflating skirt has continued. Almost everything which you find when searching for 'evening dresses' is either bias cut or somehow draped with a sleek skirt. And I don't think anyone brings fans or lace handkerchiefs these days. We might carry a huge handbag though. In 1835 the ladies went out for a walk in the afternoon wearing redingotes and big flappy bonnets. 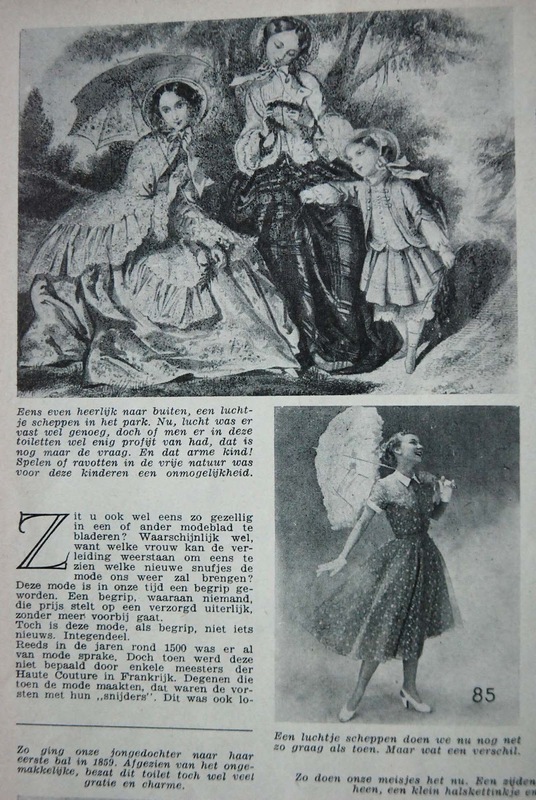 If we have to go out in the afternoon in 1954 we dress up in an easy dress with matching hat and gloves. 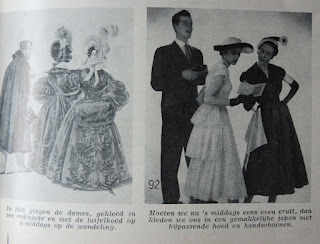 Not unexpectedly, a search for 'afternoon dress' brought me lots of pictures of very nice historical and vintage dresses and not a single piece of modern attire. The truth is, we will be dressed in the afternoon as we were in the morning and will continue to be until we go to bed in the evening unless there's something special we need to go to. And for most people, on most days, that's some variation on jeans and a t-shirt. 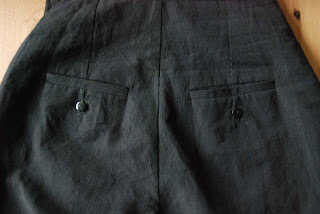 The front pocket. 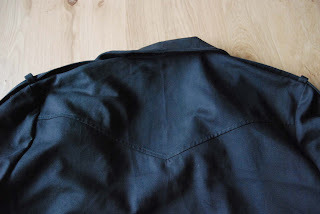 Those side pieces (which go over the place where a side seam would be) I made are a design feature you usually see in more formal jackets where they provide extra shaping and/or a location for back vents but here, I've made them functional by using the front seams to insert pockets. Back yoke. Did I mention the seam finishing before? All body seams were flat felled, and the armholes bound with bias tape.